I loathe the competitiveness inherent in listing how many “friends” you have; I dislike the idea of asking someone to friend you as well as accepting or rejecting someone’s request. That feels like high school. I've done high school. Last year, I was contacted by someone I’ve been mostly out of touch with since we were 20 except for occasional contact, when we catch up and then find we have zero to say. This time, she ended with: “If you don't have Facebook, get it! That is an order, even if you think it is stupid. I've reconnected with people 30 years after high school! I am so excited to have you back in my life!” I replied, filling her in on my life and echoing the love, but explained I wouldn’t be joining (avoiding the details here). I never heard back. I don’t like devaluing the word “friend” to encompass everything from true intimate to acquaintance to professional contact to person you once knew half a lifetime ago but may have nothing in common with anymore. Mixing worlds makes me uncomfortable. Though I realize you have some control over what’s public, I wouldn’t want coworkers to see how I interact with my friends, nor would I want to edit my interactions with the latter. And this profile of Facebook founder Mark Zuckerberg in the New Yorker only made me more confident in my decision. Random obsession: Audrey Hepburn.This started when D. and I were at a B&B in Pennsylvania. I turned on the TV, and TCM was showing The Nun’s Story, which I’d never seen. I got sucked in. I was struck by the almost documentary style—surprising for the 1950s—of the scenes in the Congo, where Hepburn’s nun works in a hospital, then by the seriousness and delicacy of her acting. I made a note to reacquaint myself with her. My first stop was her official Web site, with a fascinatingly intimate trove of photos. I looked for biographies, and all seemed cheesy; what interested me most was a book by her son Sean Ferrer—not a memoir but presumably from a reliable source and full of more riveting photos. It turned out to be a rambling but sweet tribute. There’s an insularity and an idealism toward his mother that are both touching and odd—at her deathbed, you’d think he were an only child (he’s not; he has a brother, barely mentioned) and the only person with her in her final hours (hard to believe). 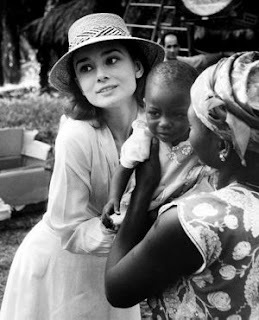 What I gleaned is that Hepburn was a truly kind, modest, humble, generous, family-oriented, loving, socially conscious person who probably was more complicated than her son cares to recall. Why should he? There was enough of the perfect to fill a book. I’ve since read Fifth Avenue, Five A.M., about the making of Breakfast at Tiffany’s and “the birth of the modern woman.” It’s easy to read but has the feel of a quickie project (the author had written a book about Blake Edwards, who directed Breakfast, so the research probably didn’t require heavy lifting). I saw Roman Holiday for the first time a couple months ago and rewatched Two for the Road recently, her second-to-last film before semi-retiring.